Sounds of Angkor - Site de soundsofangkor ! SOUNDS OF ANGKOR is dedicated to the Angkorian and traditional Khmer music and dance of Cambodia. It is also an invitation to discover 1.500 years of religious and profane Khmer music, some already disappeared and others endangered. It is the result of the research of French ethnomusicologist Patrick Kersalé that began in 1998 and continues today. All images of this site can be enlarged by simple click. All texts, photos, videos (except explicit mention) are the property of the author. They are protected by the law No. 92-597 of 1st July, 1992, on the French Intellectual Property Code. They may not be copied or exported without written permission. For any request, use the Contact page. A pedagogical project in French: DVDs published and distributed in the countries of la Francophonie by Editions Lugdivine. Two temporary exhibitions of rebuilt instruments at Theam's House in Siem Reap Angkor and Golden Silk Pheach on the way to Banteay Srei temple. Mr. Patrick Kersalé is an ethnomusicologist and archeo-musicologist. For the last twenty-five years, he has conducted research in many countries of Europe, Africa and Asia. He has notably brought a new vision on the musical instruments used by the ancient Khmer people between the seventh and the sixteenth century. Through the exhibition "Sounds of Angkor", Patrick Kersalé allows us to better understand the Khmer music of ancient times, its symbolism and its use by a population whose lifestyles are gradually revealed to the public. Through a method of photographic analysis of Angkorian bas-reliefs, the author analyzed the origin and function of ancient Khmer musical instruments in a precise manner. This enables him to highlight the details that were invisible to the naked eye. Thus he makes us discover unpublished information, answering many questions, filling wide gaps, and setting aside some preconceived ideas. 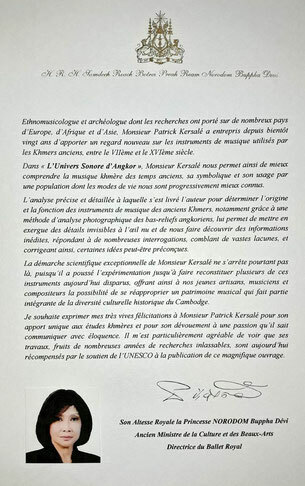 The scientific approach of Mr. Patrick Kersalé does not end there, since his experimentation has been taken further to the reconstitution of several of those instruments that were missing. He has offered our young artisans, musicians and composers the possibility to reclaim a musical heritage that is an integral part of the historical and cultural diversity of Cambodia.